Students completed an enquiry based on a photograph of a derelict part of the world, there was a choice of 30 images to fascinate learners. They must know the causal factors of the dereliction and can categorise into social, political, economic and environmental factors. They are also able to show how both historical and geographical causal factors combine to lead to dereliction and abandonment. 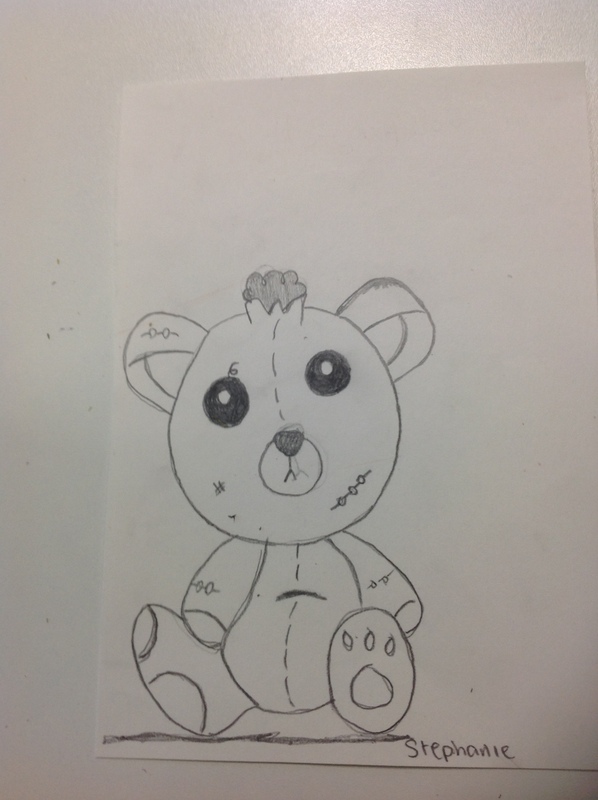 They will produce a drawing and 300 word blurb inspired by their learning of dereliction. They will use art masterclass skills and apply these alongside their PSEE factors to create their piece. We wanted students to work towards the mastery of research and recording skills. How was the idea generated? It helps firstly when planning a cross curricular project to have a leader who can connect people and departments. 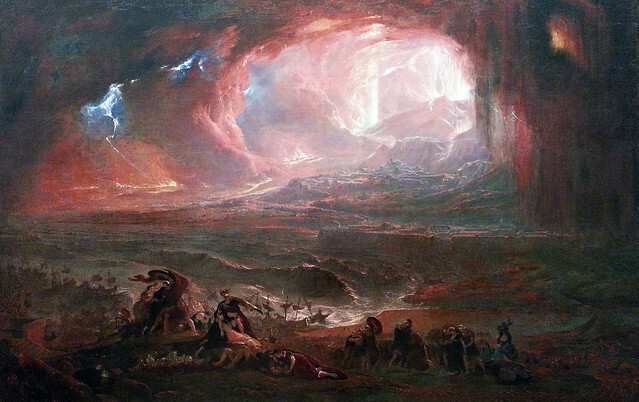 In this case an assistant head (http://www.twitter.com/rob_grattonucla) who also lead the outline and logistics of the project) insisted that Humanities and Art will do a unit of work together that is joined up and well connected. Initially there were ideas of a topic on ‘gender and women’. However after talking to a passionate friend in the pub about an exhibition at the Tate Britain, ‘Ruin Lust’, I insisted on the idea for the theme for the project should be ‘dereliction’. The exhibition was a perfect example of how the three disciplines are interlinked. How was the enquiry planned? We identified the common skills across geography and history, PSEE causation factors and research and record skills which are fairly generic to both subjects. A colleague put together the 30 images he and the department selected. These ranged from images of Ta Prohm in Cambodia, images of downtown Detroit to abandoned mines in Namibia. A project tuning session was carried out (using a project tuning protocol) with a group of colleagues and included two students who are stakeholders in the project and gave valuable opinions to the success and outcomes of the project. How were students supported to ‘deepen’ their understanding? I enjoyed reading Oliver Quinlan’s (http://www.twitter.com/oliverquinlan) book ‘The Thinking Teacher’ recently. A chapter on ‘minimum viable lessons’ got me thinking about my own practice. Generally, in this unit we are following that approach anyway. I agree, students do not need lots of gimmicks and ‘fancy new’ ways to engage them. A small amount of approaches that students are familiar with and allows them to just get on and learn is important. For me, the engagement in this task has come through the choice of topic and the authenticity of the assessment. The unit was planned with outcomes and master classes in mind, but a stream of powerpoints and planned activities were not. We aimed to teach ‘just in time’ and based on the needs of the individual learners in the classroom at the particular moment. This will be even more successful in future as students develop their collaborative skills and ways to work together (and also colleagues). It is also a much more efficient approach when there has to be communication between several teachers teaching the same class. I recently enjoyed reading Tom Sherrington’s (http://www.twitter.com/headguruteacher) ‘Pedagogy Postcard’ series http://headguruteacher.com/category/teaching-and-learning/pedagogy-postcards/ in particular his post on ‘dialogic questioning’. With an enquiry of this nature, it is important for adults to facilitate questioning to allow students to look at their topic in depth and not just skim the surface. Hot seating was one method used to do this. A student sat in the seat, explained their causal factors of their derelict photograph choice and the teacher facilitated and modelled questions to the students in the class who also asked questions after a period of time. The class understood that if they were going to sit in the hot seat they need to have a depth of knowledge. Socratic circles were also used, however, these are often more of benefit when students are looking at the same material or even material that encourages debate and opinion. This method did not work as well for this unit because students had such a huge choice of enquiry, although students were not always in agreement over the causal factors of their image when given opportunity to discuss collaboratively. In future hotseating and socratic cirles will be used or requested naturally by students to help students both deepen their understanding and to deconstruct the learning of a topic or issues further. As a geography teacher I encouraged key geographical concepts to be learned through master-classes (a way of describing didactic teaching that can be of benefit when explaining key concepts and skills quickly) and debriefs of learning. Students are expected to use academic language through discourse and in their written work, theoretically this should help students retain this knowledge and open the door to new learning. There are many links to concepts such as deindustrialisation, globalisation and de-multiplier effects for example that students were able to elaborate on and other concepts that some students have learned naturally through curiosity from their own research. This helps students in the ‘pragmatic rehearsal’ aspect of their enquiry, because the students are able to apply these concepts, they should be remembered and able to build upon them when moving to GCSE level work rather than learning them from scratch again. The idea of ‘threshold concepts‘ in subjects that open up new learning to students is worth considering in planning units of work. For example, there has been a strong thread of ‘globalisation’ throughout the year in geography lessons that has allowed students to apply this to different situations and has become deeply understood by the majority of students. They have applied this to the dereliction of Detroit and used that to make to link to other concepts such as deindustrialisation. They were also able to apply these concepts to more abstract images that on the face of them looked more to do with historical factors such as one students study of the Lion city in China. We decided that a scaffold was needed to help students develop their research and recording skills, which would form a large part of the enquiry. Master-classes were delivered to help students develop their research and record skills (sometimes didatic teaching is necessary, we don’t have to be too progressive all of the time). Some of these were organised and some were delivered ‘just in time’. For example a just in time method that was used, was to teach students how to draw a concept map (an important tool for students to be able to link back to the knowledge they already have and can be added to in the process of the enquiry to explicitly demonstrate new learning). Students were struggling to link geographical and historical causation factors but this was modelled by myself with the class using one student through a dialogue discussion. A Venn diagram was also integrated at one point during the research and recording process. A formal master-class at the beginning of the unit was delivered using team teaching. Classes were combined in a forum area of the school. Students observed and made notes whilst one teacher searched for causation factors and information based on student questions (John Sayers’ http://www.twitter.com/johnsayers question matrix helped here http://sayersjohn.blogspot.co.uk/2013/01/questioning.html) of an image of derelict Detroit. 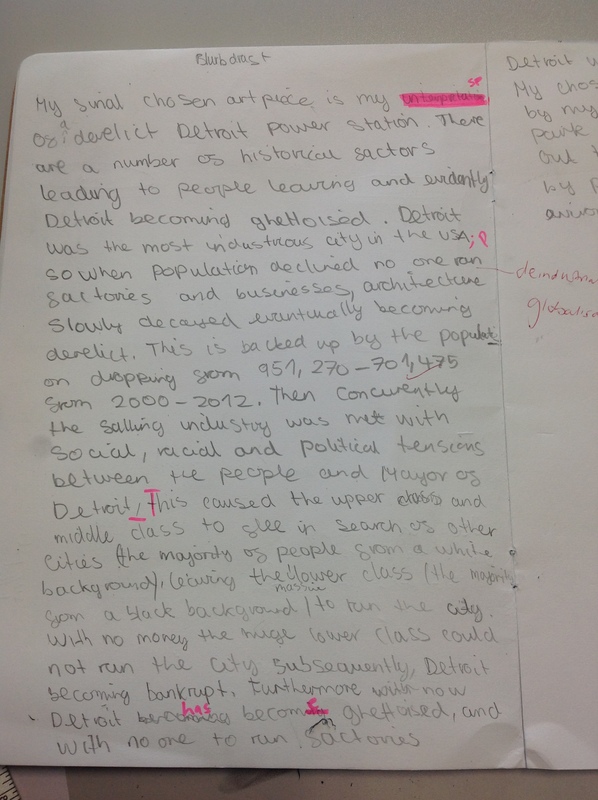 Students were able to record the factors that lead to the dereliction of Detroit whilst one teacher searched and another explained the process. Students picked up valuable skills such as how to use google search, how to scan various websites and different types of website and data that was used. There were other masterclasses that involved looking at historical sources and how to draw for example built into the unit. What methods were used to further engage and inspire students? Students were given a huge range of choice for their own enquiry. As a ‘learning set’ (a group of 6 students mixed by ability and socio-economic background) they had to choose 3 photographs/paintings out of a choice of 30 to base their enquiry. The 30 images were displayed in a permanent space in the school so students could spend a week deciding which image they were most interested in. The images were also available digitally for the students to access easily on ipad in the classroom. I have been inspired by the work of High Tech High and Expeditionary Learning schools in the USA and by reading Ron Berger’s book ‘An Ethic of Excellence’. Although, in the context of the British curriculum it is also vital that thinking pragmatically about the content and rigour needed in preparation for future assessment is also important. Experiential learning engages students in learning about the real world around them. Working at a school in London and having access to many free resources such as museums and free transport via the tube, it is relatively easy to take students out of school. My vision is to ensure each student from each learning set participates in one visit in years 7,8 and 9. By taking smaller groups of under 30 it makes trips more manageable and by having one student from each learning set they become an ‘expert’ and can feedback their knowledge to their peers when they return to school. Two trips were organised. The Ruin Lust exhibition was perfect and walking around the gallery students were engaged, making notes and absorbed in the art and the Historical and Geographical stories behind the art. By directly linking the trip to the curriculum the visit became more authentic and worthwhile. Students were also producing their own drawings and a blurb inspired by their learning about dereliction for their final products so this trip directly made a connection to that outcome. A trip to the docklands museum was also arranged and a different group of 30 students attended http://www.museumoflondon.org.uk/docklands/. This involved a short walk around the Docklands where evidence of past dereliction, old dock warehouses etc were pointed out. In hindsight this trip could have been better organised and students were not as actively engaged in the museum, possibly because they struggles to see the connection between the visit and their learning. Next time it would be better to take students who had chosen the docklands dereliction as their topic of enquiry. The next unit in Geography lessons will aim to link to dereliction and look at the opposite – regeneration. Students will be looking at the Docklands case study in more depth and given more opportunity for an expeditionary visit. A visit to a local site of dereliction was also planned, but this was cancelled due to factors of time within the project and will be integrated into the next project on redevelopment. How did we ensure excellent quality work? Gallery critique is a powerful tool particularly when students are working on their final products. It allows students to look at the WWW (What Went Well) by setting up the class as a gallery of their drafts of their art pieces. This was facilitated by the teacher, students do a gallery walk in silence and pick out specified featured to look out for and is debriefed and recorded on the whiteboard by the teacher. Student demonstrating the PSEE causation and reasons behind their drawing. Use of new vocabulary such as ‘ghettoisaton’. Inspired by the Chernobyl disaster, where belongings had to be adandoned quickly. Drafts and eventually final pieces must be digitally collected. As this is the first time we have run this project, next time having a bank of models for students to critique will be a powerful way for students to know what is expected of their final piece. This will be especially helpful to support students who find this abstract thought more challenging. It will also help students to remix ideas and take them further rather than pure imitation. In depth critiques were also carried out. 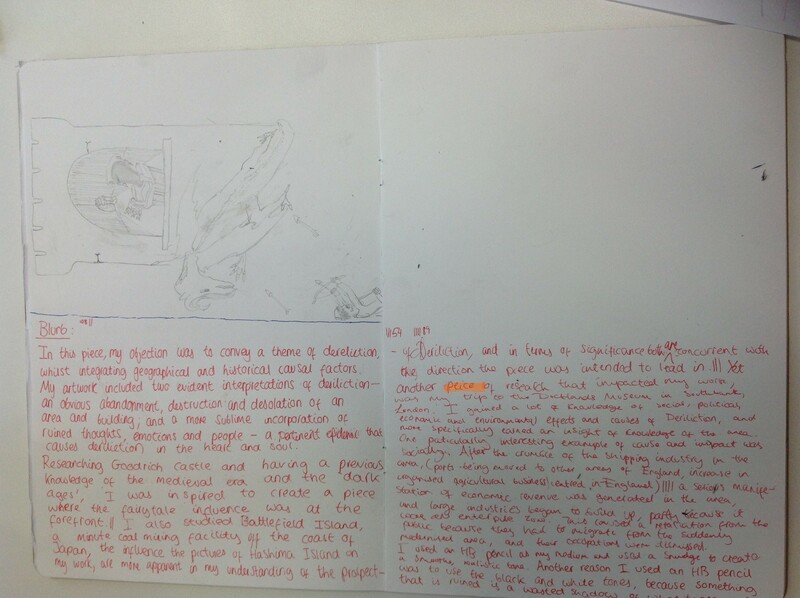 By photographing or photocopying a piece of work a whole class analysis of both the art and the blurb could be carried out using success criteria rubrics and www/ebi comments. Students could then apply this model to their own work and self assess effectively. When students were working individually for their final blurb and art pieces, it was a good opportunity to support students one to one. One technique that I recently learned about in David Didau’s new book (http://www.twitter.com/learningspy) ‘The Secret of Literacy’ was to use black space technique. Some students struggled to write less than the 300 word count. This method of crossing out repeat and irrelevant sentences for example helped students to distil their work and remove obvious scaffolding to have a well written natural document. How did students receive expert help from subject specialists? The timetable worked where students have two double lessons of humanities and a single art lesson. Students received a masterclass on drawing from an art specialist in the art period. Students were then able to use these skills and complete drafts and the reasons behinds their drawings (using PSEE factors from the research). Students were able to teach the teacher how to draw and how to use tone, contrast, cross-hatching, smudging, shading etc. Where the timetable allowed, much team teaching was done across History and Geography and use of open learning spaces helped when personalising students learning. How was the work produced exhibited? from Jeff Robin at High Tech High on curating student work, we are not quite there yet!! 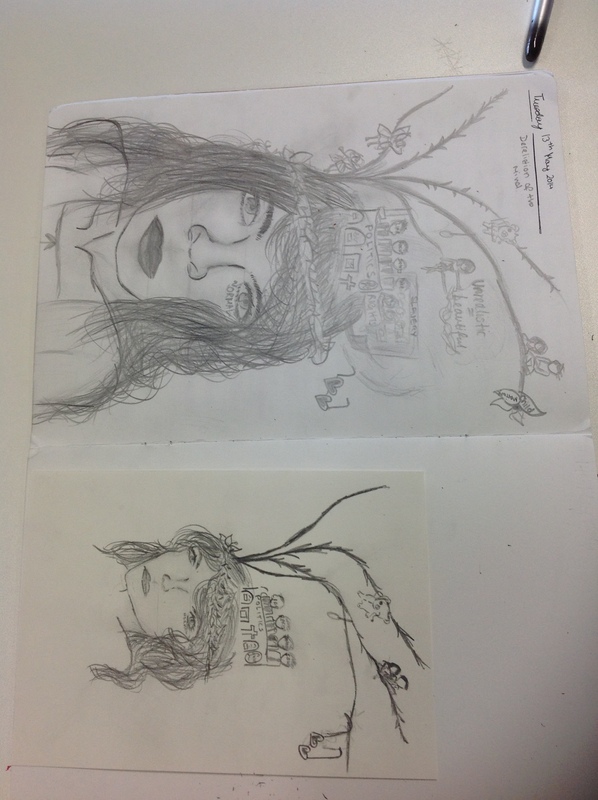 Students were working in a sketch book throughout the project. Students made notes, demonstrated their understanding of the causal factors, glued in inspiration such as leaflets and photographs. They also used this to draft/redraft their art pieces. It became a real journal of their progress and presentation was splendid compared to their subject specific books, some students in particular illustrating and making their sketch book look beautiful. Student engagement was high, it seems from observation that the students were intrinsically motivated from the project. Students demonstrated deeper learning through both written work in their ‘journals’ which was assessed and students were articulate through a series of dialogue opportunities with teachers and peers. We used a lesson study format to observe lessons. 3 members of staff would form a triad and look at the quality and engagement in learning observed in student dialogue and journals. Feedback in a future departmental meeting will help us to improve the project further. Please comment on this project and ask questions and ill add these to the blog post! Thanks!